On this page you will find out why us model horse collectors "breed" our models. This page was created to inform people new to the hobby, for confused real horse owners who want to know why their horse is in a pedigree of a model horse, and just for anyone who is curious about it. That's quite an easy question: When you start collecting model horses, it's surely not only about possesing a large amount of plastic ponies! It's about other things as well, such as tack making, naming your horses, photographing them, live showing them, or giving them their very own "pedigree". By doing all these different things, we strive to recreate a real live stable or studfarm, but in a much smaller scale. Assigning your horse a pedigree is like having a new foal born. Some collectors feel that only when they have a pedigree for each and every horse, their collection is complete. In general: it makes the hobby much more realistic. How do you assign a horse it's parents? A bit more complicated. Genarally when choosing your horse's sire and dam, it's all about their conformation, breed, color, age and achievements. The easiest way to look for the perfect sire or dam is to look at websites of real horse studfarms. First you need to find a farm that breeds the kind of horses you want (e.g. : Quarter Horse, Thoroughbred, Arabian). Then you look at horses that have the same color as your horse (or at least one of the parents, or parents that can produce the color the foal needs to be, e.g. : Cremello x chestnut = palomino). Then you look at the horse which has the best conformation and achievements. When you made your pick, you can search their pedigrees at Pedigree Query. When you've found the pedigrees of your horse's sire and dam, you can easily create a pedigree with HTML here. When you're done, all you need to do is add the HTML to your website. There's another way too: using model horse studfarms (such as this one) who offer their sires and dams for breeding for free! This is maybe easier then to check the real horses that are available. When you've found the right sire and dam at a model horse stud, the only thing you need to do is to send a "Breeding Request" to the sire owner. He/She will send you a breeding certificate by e-mail. When contacting the owner of a model horse stud, always make sure to have read the "Breeding Policy"! Do you ask permission to the real horse's owner? Some owners of real horses do not agree when other people use their horses for pedigrees for model horses. They think it's stealing and that the model hobbyists are making profits from these pedigrees. This is not true of course, and pedigree assignment is just for fun. Almost every model horse stud farm or stable has stated somewhere that the use of real horses in pedigrees for their models is purely for entertainment and educational purpose. Collectors and model horse stable owners gain absolutely no profit by using the real horses. All the breedings done at the model horse farms, are FREE! Except in the case of paper certificates that need to be send by post, but in this case you pay for the paper, the ink and the shippingcosts of the certificate. In my opinion, real horse owners should be flattered when their horse is used for a model horse pedigree. It means that their horse suited the model horse as a parent so perfectly, that it was chosen out of hunderds of other available stallions or mares. Plus the fact that it is generally good advertisement of the real horses for free! Besides that, model horse owners usually don't ask the permission of a real horse owner because it confuses the real horse owners. They usually don't know anything about the model horse world, and they're very surprised to hear about it. So let me put this all together: We don't aks real horse owners permission because it is confusing for the real horse owners. 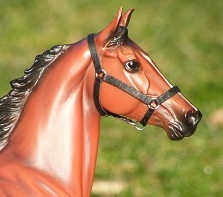 Collectors do not profit in any way when they use a real horse in the pedigree of their model. If you have any questions regarding Pedigree Assignment, I'd love to answer them for you. Please e-mail all your questions to the email adresses listed on the Contact page. If you want to request a breeding form this stable, please read through the "Breeding Policy" page first, and then send your requests to the same mail adress as stated above.